The Beauty of Life: Beauty Question: What Nail Polish Are You Wearing? Beauty Question: What Nail Polish Are You Wearing? I'm sure we all have our nail polish painting rituals. Some of us go to the salon or the walk-in nail places scattered along the street. Others, like this beauty chick, paint them on Sunday evenings while we watch Brothers and Sisters. (Hey, whatever works.) 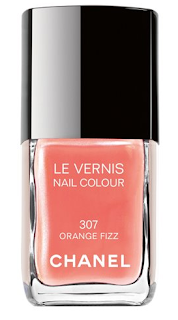 Well, this week I decided to treat myself to quite the springy color -- Chanel Orange Fizz -- and I must say, I am loving it! It's bright but not too orangey -- it looks just like an orange popsicle but a bit creamier in texture. No streaking, no clumping, no gooeyness to speak of -- it just glided right onto the nail and seriously has been punching up every outfit I've worn this week! So my current Beauty Question is this. What nail polish are you wearing? Let me know in the comments! I'm wearing orange too - but much brighter! CG Orange Marmalade - such glittery goodness! Thanks for sharing on your blog - I love it! I'm wearing China Glaze IDK from their holographic collection...it's this amazing deep lavender holo that is my new favorite polish! Sally Hansen Insta-Dry in Mauve It. Its a robin egg blue, and I am actually LOVING IT! I'm wearing Essie Fit Me on the Jitney ~ a classic, sheer pink.